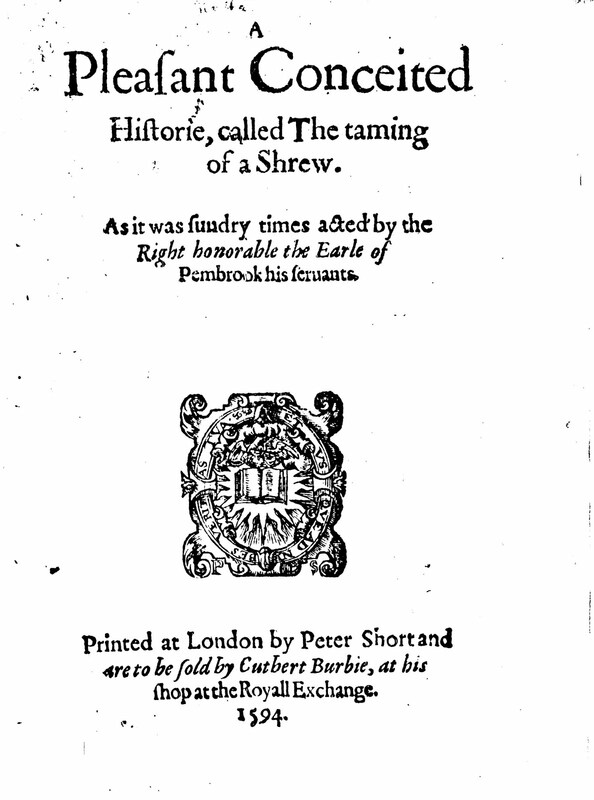 A Pleasant Conceited History called The Taming of a Shrew was printed for the first time in 1594 without any author’s name on the title page. The comedy is actually two plays, one within the other. The main story takes place within a “frame” of scenes. Two of these scenes appear at the outset, before the play-within-the-play begins; several of the framing scenes also occur throughout, at intervals; and finally, after the end of the “Taming” play, a single scene completes the full surrounding structure of the frame. For you must play before a lord tonight. The two opening scenes of the frame continue until Sly, awake and believing himself to be a wealthy nobleman with horses and hounds as well as a company of players, turns to attend the “taming” farce that the Elizabethan audience itself is about to attend. But who was the anonymous writer of this ingenious farce? When it was performed for the Queen, court members might well have suspected it was Edward de Vere, Lord Oxford, the only nobleman among them who matched the “Lord” in every way. (Also, reinforcing the identification is the setting of the frame scenes in present-day Elizabethan England — an anomaly. Did the dramatist “Shakespeare” ever use a present-day English setting anywhere else?) In the 1580s, Oxford had patronized two companies of actors while leasing one of the earliest private Elizabethan theaters, the Blackfriars. He was well-known for his love of horses, hawks, hounds, banquets, costly apparel and music; he was a prankster, a teller of tall tales, acknowledged as among the best of the courtier poets and, too, as one of the few members of the nobility who wrote plays, especially comedies, and even, for his own amusement, acted on the stage. 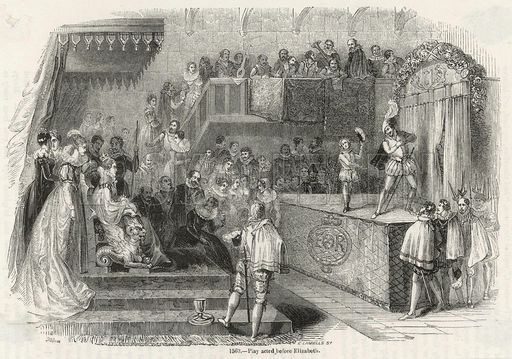 So when members of the elite audience at the royal Court saw the Elizabethan Lord on stage with his players, they must have roared with laughter during one of the framing scenes in which Sly, reacting to characters in the play as if they are individuals in the real-life world, suddenly shouts that he wants none of them to be sent to prison. “Don” is a Spanish title used by a nobleman and “Christo” represents Christ – the Lord. And, too, given that “Vere” was pronounced “Vair” (as in “Fair”), clearly Sly has come to believe that he himself is “Don Christ-O” — the Lord Oxford — Edward de “Vary” or Vere. And the court audience would also know that the nobleman whose place Sly has taken must be that same merry-madcap earl, who is sportively giving them a “sly” portrait of himself on stage. Nearly three decades after 1594, in 1623, a much longer and more mature version of the same comedy will make its initial appearance in the First Folio of Shakespeare plays. Now A Shrew will become The Shrew – with Sly named Christophero or Christopher Sly – attributed for the first time to William Shakespeare. The producers of the Folio will print the beginning of the frame, with Sly and the Lord, but will they NOT include the rest of the frame, in which Sly cries out that he is “Don Christo Vary”. No, they will not print the rest of it. Instead they will drop all the other framing scenes, even the final one – being intent upon further concealing Oxford’s authorship at all cost. The Folio project in 1623 is where the tilt toward Stratford upon Avon will begin. (There is no other link to Warwickshire till then.) And they will sacrifice the integrity of The Taming of the Shrew by cutting out all of the frame except the opening two scenes, which will be known in the future as “The Induction”. Part Two will conclude this “reason” with other aspects of both Taming plays. The bottom line is that the traditional attribution of authorship has led the Academy away from the instinctive, logical view that A Shrew and The Shrew represent two different stages, perhaps far apart in time, within the career of a single author. The result of this failure to acknowledge the obvious is an inability to comprehend how the greatest writer of the English language actually worked – not in a single, feverish whirl of magical genius, but, rather, by laboring over a long periods of time, in separate stages of his own experience and growth, to achieve his final masterpieces of drama and dramatic literature. “Shakespeare conceived these introductory scenes about Christopher Sly and the trick played to convince him that he is a great lord with an apt comic touch that is almost always successful on stage, but in the First Folio text Sly disappears from the play after Act One, scene one. Considering Shakespeare’s usual care in resolving all the plots of his plays … some scholars speculate that the text we have is corrupt. 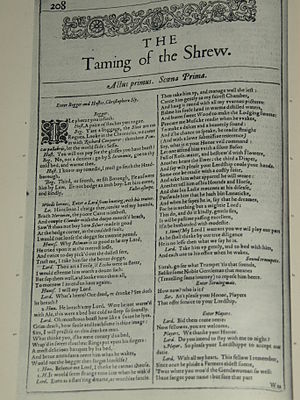 “Beginning with Alexander Pope in 1723, editors have often added to Shakespeare’s play The Taming of the Shrew scenes taken from another, anonymous comedy printed in 1594 called The Taming of a Shrew — a practice sometimes adopted in the theater as well. 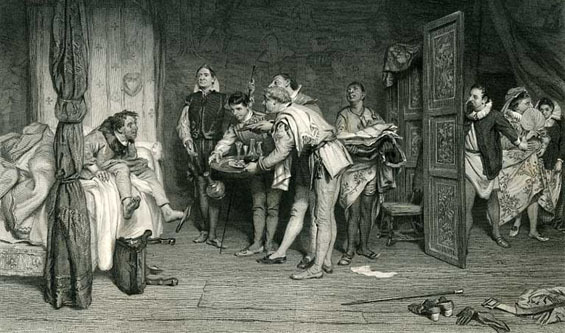 Because of its similarity to Shakespeare’s play in plot and structure, scholars have debated whether Shakespeare had any hand in the writing of A Shrew.